I just love all the different styles of wine glasses that are now available. The more unique they are the better I believe. I have seen some crazy looking wine glasses but absolutely love them all. Some of them can be funny and some of them can be visually striking. No matter which though, unique wine glasses will always be a co﻿nversation starter and center of attention at dinner parties or when having guests around. 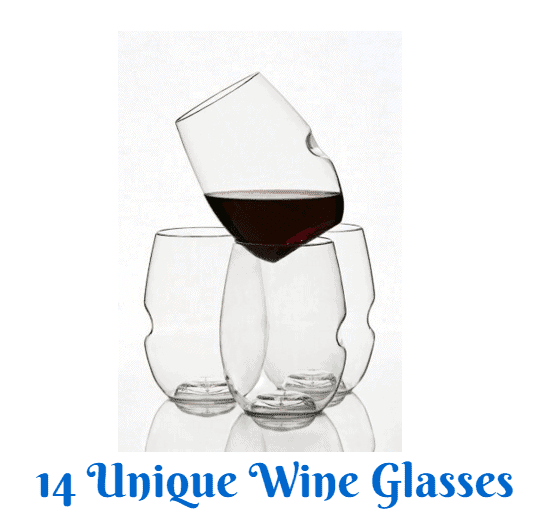 There are plenty of unique wine glasses and I would love to feature them all on this list but I would be here all day and so would you so instead I have listed all my favorites. Some of these favorites include porto sippers, hand painted wine glasses, funny wine glasses, metallic wine glasses, silicone wine glasses and more. 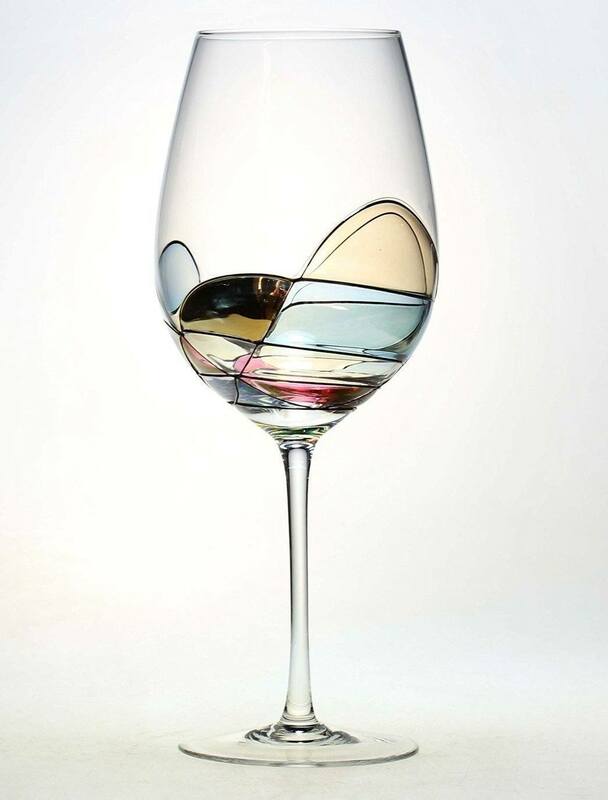 Do you already have any of these unique wine glasses? Which are your favorites? Do you have any more to add to the list? You can always leave your comments at the end of the list because I’d love to know. Well if there is one thing these wine glasses are, it is unique! I don’t think I have ever come across any other wine glasses that even closely resembles the Oenophilia port sippers wine glasses. I love how they are so unique and different though. You can either get a set of four of these or a set of twelve, although it works out cheaper to buy three of the sets of four than one set of twelve. The trunk of the glass acts as the straw to save from any spillages when tilting a wine glass. They are smaller than a standard wine glass but that doesn’t really matter considering how unique they are to look at. They are traditionally used for port and liqueur to keep the liquid warm with your hands but they make for a truly unique wine glass too. My mum actually has a set of these unique wine glasses that she usually places out on the dining table on s﻿pecial ﻿o﻿ccasions such as Christmas. They are truly striking wine glasses that have a gorgeous stem too. They are certainly pricier than the first wine glasses on the list. However they are made of pure quality and will really add a pop of colour to your dining table, kitchen and even wine rack if you have one that holds glasses too. The great thing about them is that they are huge which just adds to their uniqueness. They are truly beautiful and are a must-have for all wine lovers. Could you really get any more unique than this? This is just pure genius and it certainly put BigMouth on the map for unique when wine glasses. I have a number of wine glasses from BigMouth already because not only are they unique but the quality of them is excellent too. For this very crazy unique wine glass. I think that is excellent for what you get. It would also make an excellent gift for wine lovers and even those who just enjoy a good laugh and love adding ﻿humor to their home. Obviously it isn’t something you’re going to drink out every time you want a wine. It is more for novelty and will look good as part of your kitchen or dining room décor. These wine glasses are great when inviting ﻿guests around for dinner because you can simply write their names on the glass. It is different than having to write place cards and would work great at weddings too. 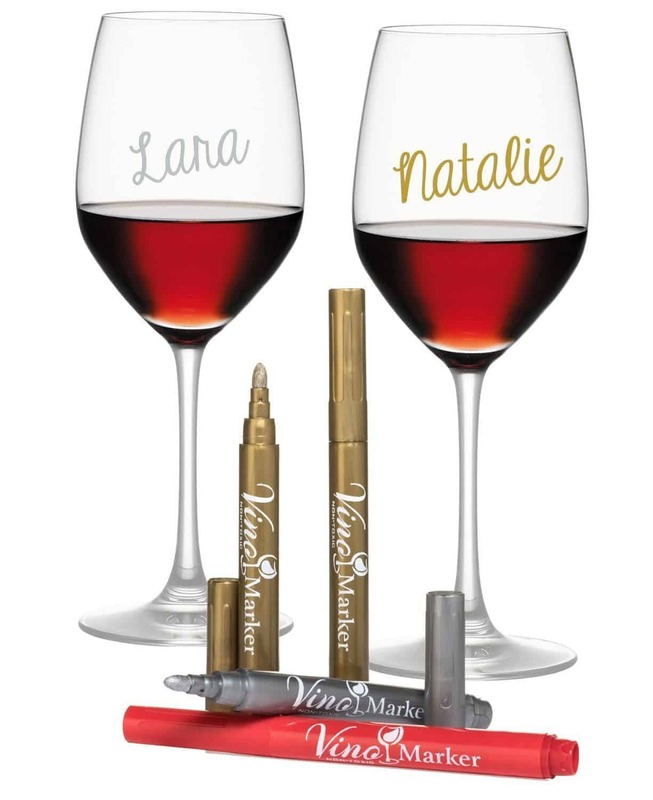 The red pen, silver pen and gold pen are also included and when they are written on the glass, will last all night. You can easily get the ink off of the glass when washing it in warm soapy water too. You don’t just have to stick with writing names neither if you’re feeling creative. You can also use the pens to draw flowers and any other decorations. We all need a bit of wine therapy now and again and when we do, why not drink out of a glass that says so. This wine glass is great fun and will always bring a smile to your face when you’re feeling a bit down or have had a hard day. You can buy this fun wine glass, which is certainly pricier than some of the other wine glasses on the list but it is made of quality. While the glass is indeed funny, that does not mean that it is cheap looking. 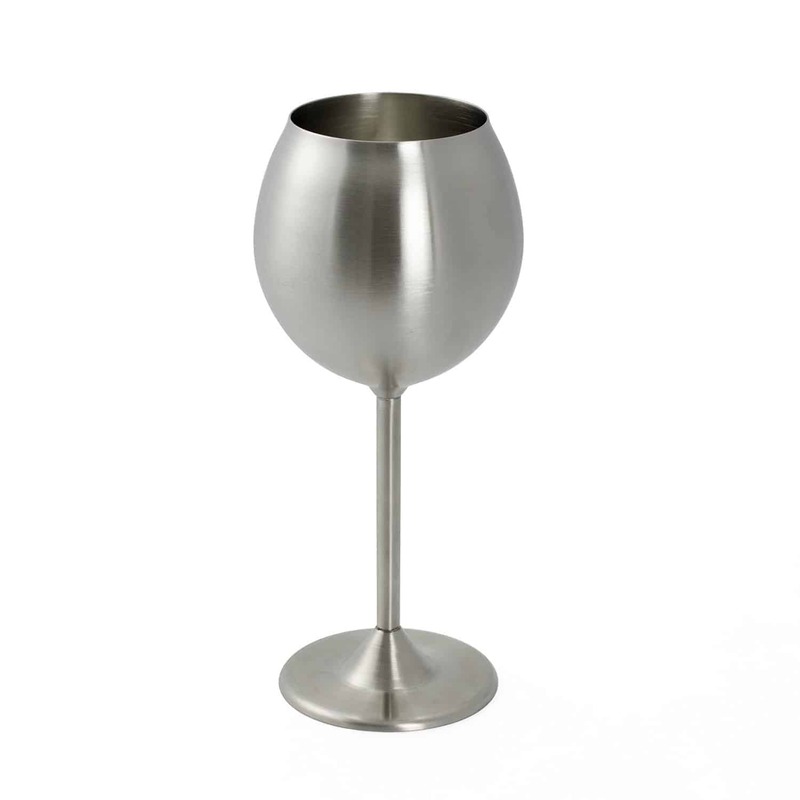 This wine glass is truly awesome and it will fast become your favorite go-to wine glass after a hard day at work. This wine glass is form the same makers as the last and so is equally as awesome. This time the wine glass has three phrases on which is “great night”, “good night” and “what night”. It is great for when you have friends around and will be sure to make them laugh. You can buy this wine glass which again is quite pricey compared to some others but it is well worth every cent spent on it. This would also make a great gift if you have any wine e﻿nthusiast ﻿frien﻿ds or even those that would find this funny. I collect wine glasses and I have this one already in my collection and so I can tell you that the glass is amazing and very well made. These amazing wine glasses are definitely unique and look almost like lightbulbs when they are empty. I love how there is no stem and also the frosted glass effect. In fact, everything about this wine glass I absolutely love. 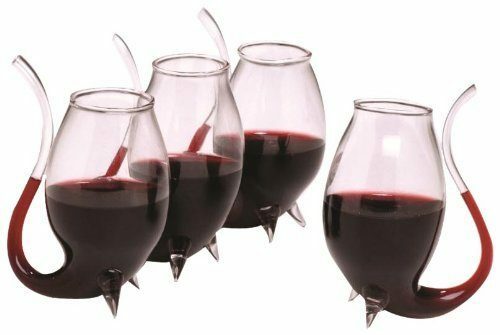 You can get a set of 4 of these silicone wine glasses are affordable and you can enjoy them for a very long time. They are literally unbreakable so no more smashed wine glasses. You can also use them for others drinks too; they don’t just have to be for your wine. While I’m on the subject of unbreakable wine glasses, now is the perfect time to talk about the stainless steel unbreakable wine glasses. If drop one of these, it will bounce off the floor almost without smashing into tiny pieces. You can get two of these unbreakable wine glasses for an affordable price. Not only are they unbreakable but the stainless steel helps to keep any wine poured into them at the same temperature. No more warm white wine hoorah! You may worry that the stainless steel will be a nightmare for fingerprints however this won’t happen because of the brushed finish. While this is not exactly a wine glass as such, I couldn’t help myself but add it to the list. This would just be amazing for a day out watching the ﻿horse racing, going camping or anything else. As I seen this fantastic product, literally so many ideas passed through my mind. I think these would be well worth the money just because of how many things you could use it for. 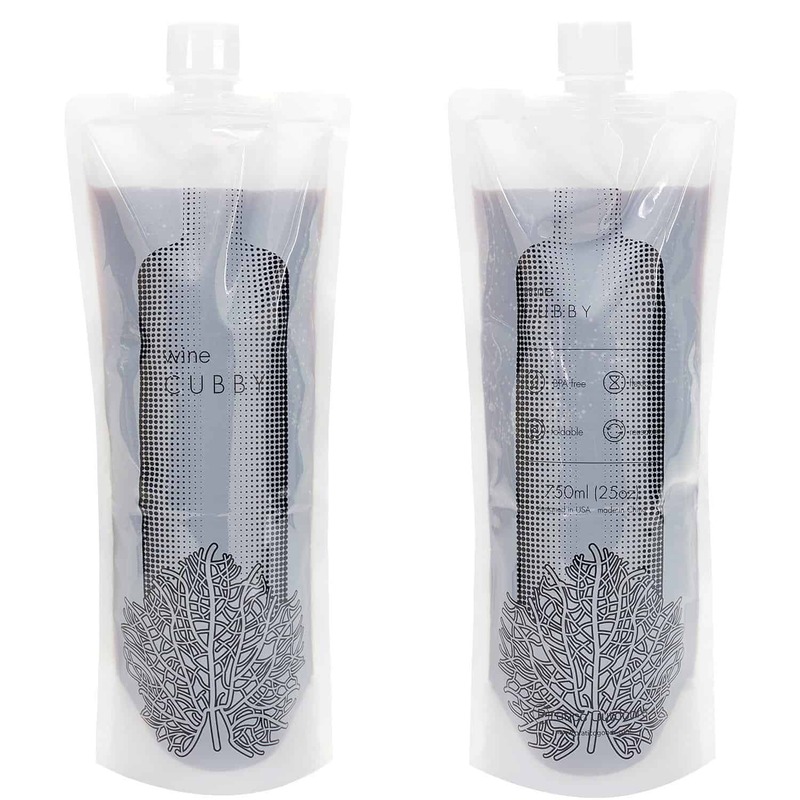 It can fit in a whole 750ml bottle of wine and is made from BPA free food grade plastic. Again, it doesn’t have to just be for your wine. There is a review from a mum who used it to carry juice for the kids! 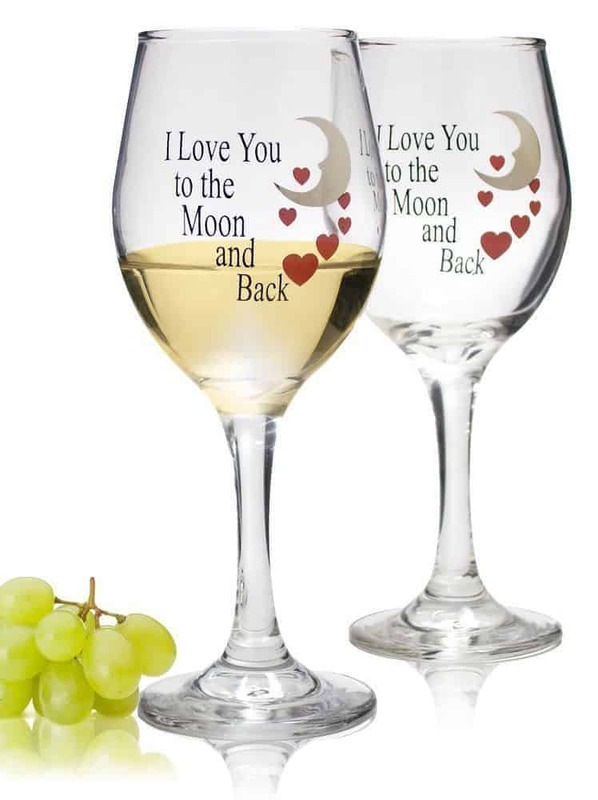 I love these very cute wine glasses that have the quote “I love you to the moon and back” on them. They would make ideal gifts for newlyweds or maybe even for your other half for Valentines or their birthday. You can get a set of two of the wine glasses for an affordable price, which I think is a good for the quality of glass you get. Because of the etching you will only be able to hand wash these but that is very common with any wine glasses that have etching on. 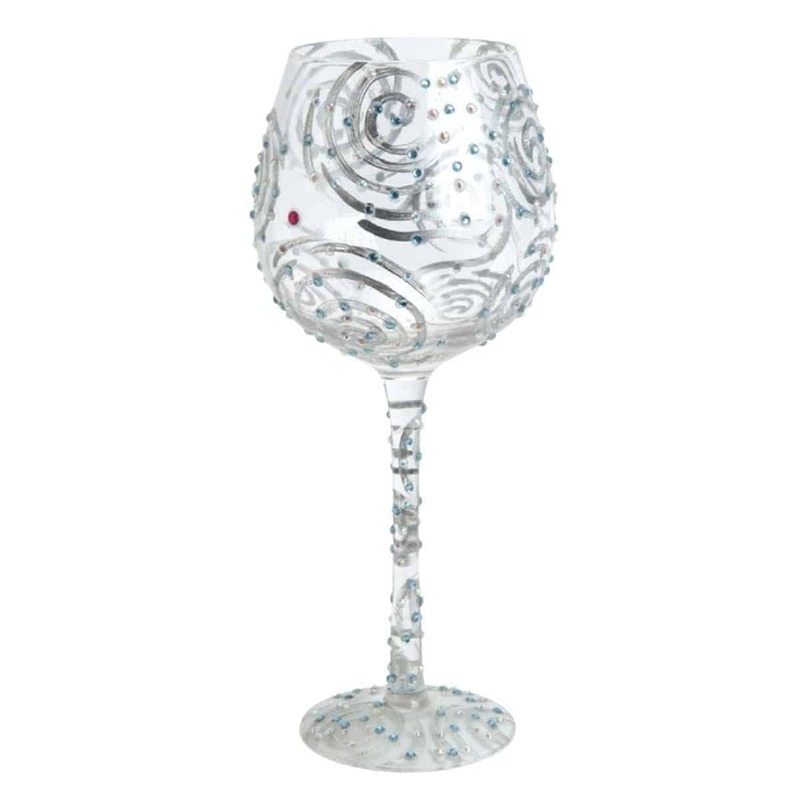 The metallic moon and cute red hearts is what brings this wine glass to life and really creates a beautiful and delightful way to enjoy your wine. 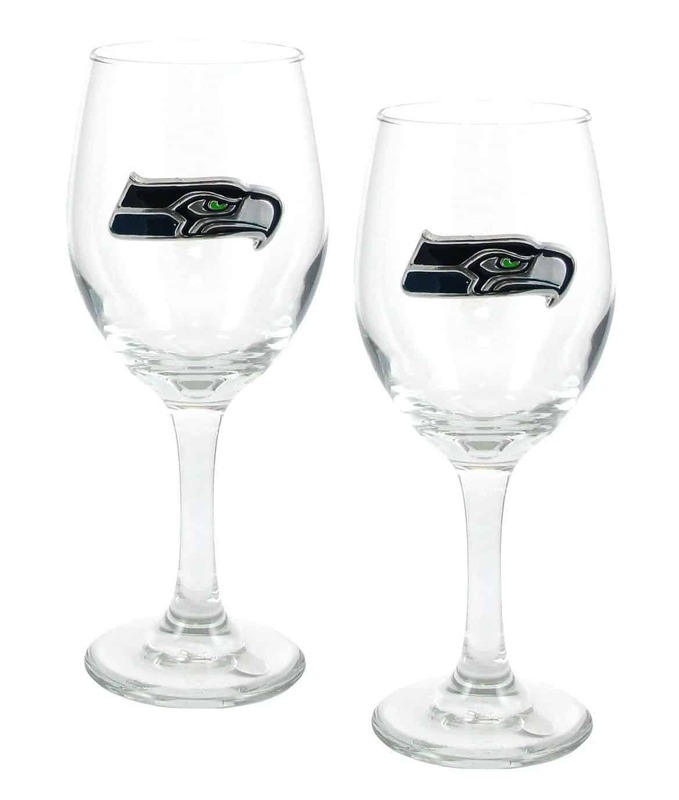 If you are a football fan and a wine enthusiast, these wine glasses were made for you. If you know someone who is a football fan and wine enthusiast then this would make a great gift for them which I’m sure they’ll cherish. You can choose from 30 NFL teams, each of which has the ﻿team ﻿logo branded on the wine glass. You can get a set of two for a price that is one of the more expensive wine glasses on this list but for plenty good reason. If you enjoy having friend around to watch the game but aren’t really a beer drinker then this is a great way to join in on the fun. These are such clever little wine glasses that look like real glass but really they are made from an ultra-thin BPA free polymer. The little indent is also clever as it is for your thumb to have a better grip of the glass. You can either get 12 ounce glasses or 16 ounce glasses an can also get a set of 4 glasses, 8 glasses or 12 glasses. The 12 ounce glasses in a set of 2 costs are affordable and will come in handy when planning a party. They are a great alternative to plastic cups which are commonly used for parties and will still make guests feel they are drinking from a glass. Everything about this wine glass is simple perfect! The shape of the glass itself, the etching and the jewels have all made this wine glass into something spectacular. This would make the perfect gift for someone’s birthday. This is one of the more pricer wine glasses. However it is quite large and can hold up to 22 ounces of wine instead of the usual 10 ounces. It really is a centrepiece and will be sure to start conversations. People who have bought this wine glass could not be happier with it whether it is for themselves or bought as a gift for others. I’m sure you remember the craze of Fifty Shades of Grey, it felt like it took ﻿over the world at one point. Even those who hadn’t picked up a book for years started reading again. 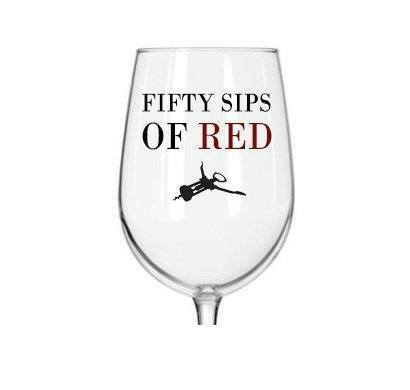 There are many Fifty Shades of Grey fans out there and whether you’re one of them or you know someone who is, this wine glass is absolutely perfect for you or them. It comes in a “50 sips of white” version too if you prefer to drink white wine or red. You can both buy of them so that when guests come around you can surprise them with this funny wine glass. The great thing about this wine glass is that it is strong and thick and not cheap looking as some funny wine glasses can be. 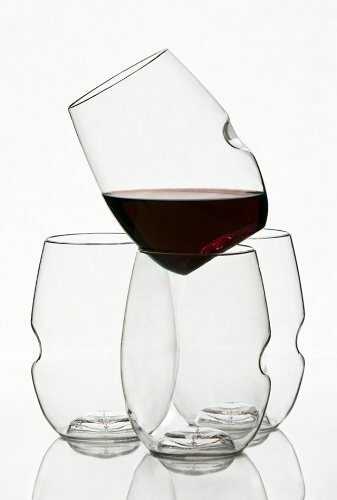 Fore more wine accessories, check out our reviews on other types of accessories as well.